dyes. These sensitizing dyes are adsorbed to the surface of the silver halide crystals. The phenomenon of sensitization was discovered in 1873 by the German scientist H. W. Vogel. When they absorb light of wavelengths greater than 500 nm, the adsorbed layers of the sensitizing dye impart the acquired excitation energy to the silver halide micro-crystals. The mechanism of this process, wherein the latent image specks appear, has not yet been studied in sufficient depth. It is still not clear how during this process the conditions are created for the initial photochemical event—the separation of an electron from the negative halogen ion and, accordingly, the transition of the electron from the valence band of the silver halide crystal to the conduction band. Every sensitizing dye imparts to the emulsion layer a sensitivity only to radiation in a relatively narrow portion of the wavelength range from 500 to 1,200 nm. For this reason, to increase the region of additional sensitivity, several sensitizers are usually added to the photographic emulsion at the same time. In the infrared region (λ > 700 nm), the most commonly used dyes sensitize to radiation with wavelengths of up to 900–1000 nm. Sensitizers for longer wavelengths are less efficient and do not keep well (see INFRACHROMATIC MATERIALS). 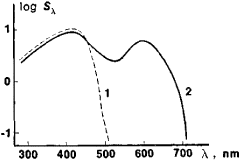 The techniques of spectral sensitometry are used to make quantitative assessments of the results of sensitization. Optical sensitization is widely used in the preparation of most present-day black-and-white and all color photographic materials to provide not only broadened spectral sensitivity but also an overall change in sensitivity to light (seeDESENSITIZATION). Gorokhovskii, Iu. N. Spektral’nye issledovaniia fotograficheskogo protsessa. Moscow, 1960. Meikliar, P. V. Fizicheskie protsessy pri obrazovanii skrytogo fotograficheskogo izobrazheniia. Moscow, 1972.